©2017 MDHearingAid, Inc. All Rights Reserved. "I was amazed! Sounds I hadn't heard "I was amazed! Sounds I hadn't heard in years came back to me!" — Don, January 2016 — Don, January 2016 DOCTOR DESIGNED | AUDIOLOGIST TESTED | FDA REGISTERED For Less Than $ 300 ADVANCED HEARING AID TECHNOLOGY The answer: Although tremendous strides have been made in Advanced Hearing Aid Technology, those cost reductions have not been passed on to you. Until now... 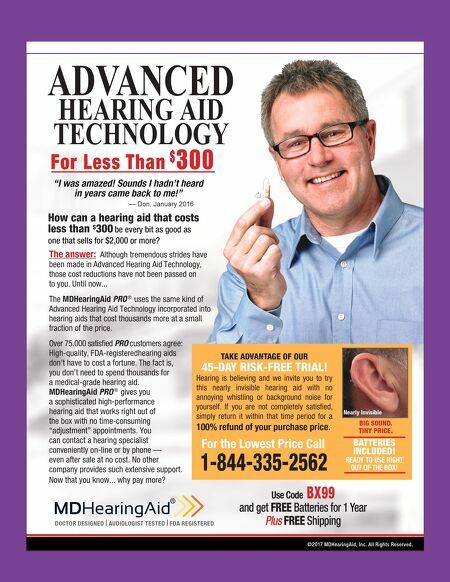 The MDHearingAid PRO ® uses the same kind of Advanced Hearing Aid Technology incorporated into hearing aids that cost thousands more at a small fraction of the price. Over 75,000 satisfi ed PRO customers agree: High-quality, FDA-registeredhearing aids don't have to cost a fortune. The fact is, you don't need to spend thousands for a medical-grade hearing aid. MDHearingAid PRO ® gives you a sophisticated high-performance hearing aid that works right out of the box with no time-consuming "adjustment" appointments. You can contact a hearing specialist conveniently on-line or by phone — even after sale at no cost. No other company provides such extensive support. Now that you know... why pay more? Use Code BX99 and get FREE Batteries for 1 Year Plus FREE Shipping For the Lowest Price Call BATTERIES INCLUDED! READY TO USE RIGHT OUT OF THE BOX! TAKE ADVANTAGE OF OUR 45-DAY RISK-FREE TRIAL! Hearing is believing and we invite you to try this nearly invisible hearing aid with no annoying whistling or background noise for yourself. If you are not completely satisfi ed, simply return it within that time period for a 100% refund of your purchase price. Nearly Invisible 1-844-335-2562 BIG SOUND. TINY PRICE. How can a hearing aid that costs less than $ 300 be every bit as good as one that sells for $2,000 or more?